Heads up everyone. This is seriously cool. 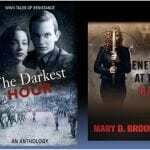 The upcoming official release of “The Darkest Hour” anthology will be on January 22. The authors of this incredible volume are running a contest for all readers who are interested in WW2 stories and WW2 Resistance. What do you have to do? Glad you asked! 2. Contest deadline is Jan 21.